I discovered chiropractic when I was an undergraduate. A friend had introduced me to chiropractic when I was telling him about my trouble breathing. He recommended me to go pay a visit to his sister, who happened to be an upper classman working at the Palmer Chiropractic Clinic. When I arrived at the clinic, she took me back for an exam. She checked my posture and did a series of orthopedic and neurological exams. After the exam, I walked home and I was still feeling that chest pain at the time when I took a breath in. The day after, I came back to get my first chiropractic adjustment. She used a clicker tool, which now I know as an activator, and clicked a few tender spots in my back. That day when I walked back home, I didn’t sense that pain that I had been getting for the past few weeks. At that time, my interest for chiropractic started. I went back to school the next day to ask my friend more about chiropractic. He explained to me how chiropractic can maximize the potential of the human body, and I knew then that this was what I wanted to pursue as a career. During my time as a student intern, I worked as a Chiropractic Teaching Assistant at the Palmer Moline Clinic in Iowa. Working at the Palmer Moline Clinic, I have successfully treated patients with acute and severe low back pain, neck pain, and extremities. I was successful in treating patients with the use of cutting edge techniques such as Palmer Package, Cox Flexion-Distraction, Activator, and soft tissue work. 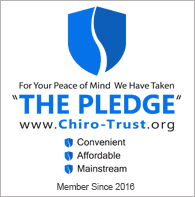 I focus not only on the adjustments but also nutrition, soft tissue, and educating patients on home exercise specifically for their condition. My passion is to raise awareness of the importance of health and wellness, allowing them to perform at their highest potential. I am a first generation chiropractor. I fluently speak both English and Vietnamese. I enjoy traveling and trying new and exotic foods. My dream is to travel to countries around the world and experience the culture and authentic local cuisine. I also enjoy crabbing, fishing, clamming, and sightseeing on my free time. I am thankful to have chiropractic in my life, because it has allowed me to live a more fulfilling life.